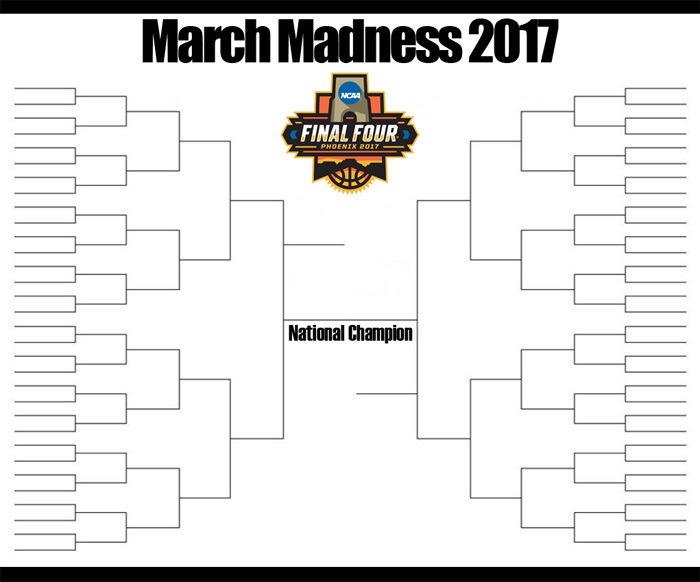 March Madness 2017 gets underway on Tuesday, March 16th with the opening round in Dayton, Ohio. The “Big Dance” will wrap up with the national championship game on Friday, April 3rd. You can follow all the action with the March Madness 2017 bracket. You can download the March Madness 2017 sheet instantly and print it off for free courtesy of PrintableBrackets.net. A total of 68 teams will be in the field for March Madness 2017. The field will be set following the conclusion of the conference tournaments and “Selection Sunday” on March 12th. The “First Four” will square off in Dayton before the tournament begins in earnest on March 16th. The Final Four will be held at the home of the Arizona Cardinals at the University of Phoenix Stadium in Glendale. The two national semifinal games will take place on April 1st, which the title game will be played two days later. In 2015, the stadium hosted Super Bowl XLIX. The Villanova Wildcats enter March Madness 2017 as the defending national champion. After getting past UNC Asheville, Iowa, Miami (FL), Villanova outlasted Kansas, 64-59, to capture its second men’s basketball title overall. They have 5 final four appearances, which is the 14th most all-time.